The GY-HM150U is JVC’s latest and most advanced compact handheld camcorder. Based on the solid ergonomic design of the highly popular GY-HM100–currently in use by thousands of photojournalists at major television stations and networks around the world–we’ve upgraded the camera’s features and performance without changing the attributes that made its predecessor so successful. A new encoder delivers not only improved HD recordings, but adds support for standard definition (SD). Manual controls are now more intuitive than ever with an iris dial next to the lens, and a total of 6 user assignable buttons. And shooters will love its dual card recording capability that creates an instant back-up copy! The GY-HM150 offers the world’s fastest workflow delivering files that can be instantly edited in all professional level editing systems all while producing recordings on par with broadcast cameras. 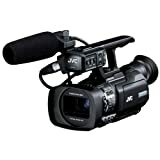 The JVC GY-HM150 is highly recommended for demanding news and production assignments.